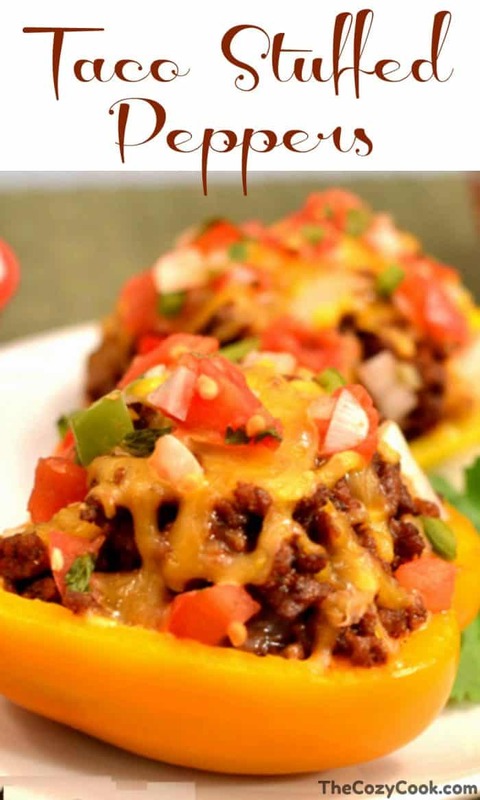 These savory taco stuffed peppers are filled with ground beef or turkey and sprinkled with your favorite taco toppings and melted cheese! 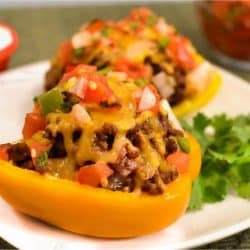 My favorite thing about taco stuffed peppers? No soggy shell! You can load up on all of your favorite taco fillings and sauces and take your time eating, because that crisp pepper is here for you. I am personally thanking my lucky stars for this kind of meal right now, because my little toddler is usually too busy crawling up my leg to allow me to sit down and eat very long. The last time I tried to eat tacos with a regular shell, I got about halfway through and literally forgot about it until she was in bed, at which point it was totally soggy and I had to toss it. And wasting food is not okay with me. You can load these bad boys up with basically, uh, whatever you want. Ground beef, ground turkey, shredded chicken, whatever ya got. Taco toppings are also very easy to be flexible with. Oh, and the health benefits. Let’s not forget about that! 50 calories saved for each baked taco shell that you replace with a bell pepper half. 138 calories saved for each fried taco shell that you replace with a bell pepper half. 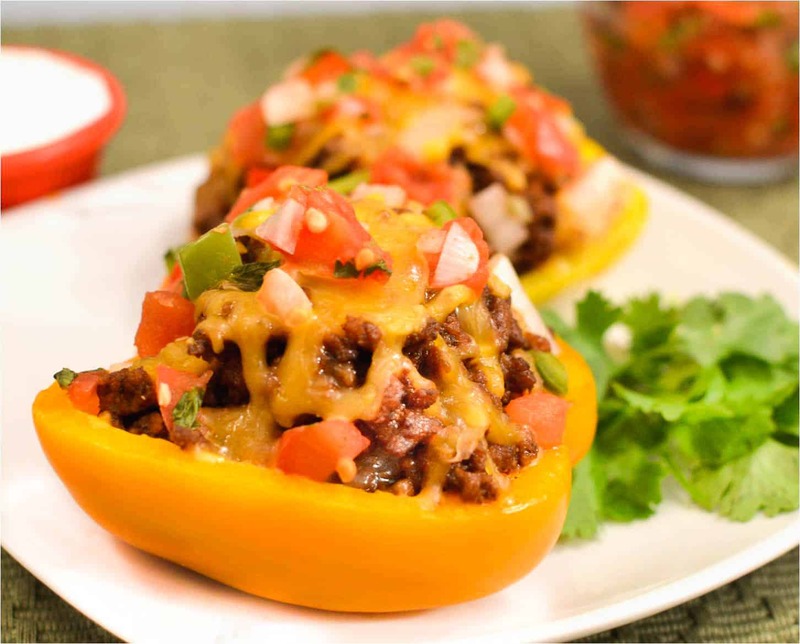 …Taco stuffed peppers it is! And by the way, if you like this, you’ll have to try my Mexican Egg scramble. Ah-maz-ing. Before you go, you should totally sign up for my free email list, and follow me on Facebook/Instagram/Pinterest. Doooooo it! Place the empty bell peppers (hollow side- up) on a greased baking pan, and bake in the oven for 15 minutes. Meanwhile, in a frying pan over medium heat, add ground beef, onions, and garlic and cook for 10 minutes. Add the taco seasoning and 3/4 cup water. Bring to a boil and then reduce the heat to medium-low. Add the black beans and tomatoes and simmer for 5 minutes. Scoop the taco filling inside each of the baked peppers. Top each with cheese. Bake in the oven until the cheese is melted. Serve with salsa and sour cream! This is an exciting and vibrant twist on tacos. I live in Imperial Beach, across the border from Tijuana. I eat a bunch of tacos. After I try it your way I will experiment with carne asada filling. Your stuff is inspirational. I am going to climb out of my rut. I made these for dinner tonight. I baked the peppers for 20 minutes because I wanted them a bit softer and they were still crisp enough. I also added rice to the mixture. My husband and i loved them. Made extra for lunch tomorrow. Thanks for the recipe. I’ll be making these again. Are the calories per half pepper or one whole pepper? Hi Megan- just regular red/green/orange bell peppers that you find in the vegetable section, check out this link.